Gleason’s parents, Mae and Herb Gleason, bounced between Bushwick tenements during the 1920s but Gleason often recalled the years spent in apartment 3-A of 328 Chauncey Street. The dingy flat would serve as the model for the apartment set used in The Honeymooners. To mark the 60th anniversary of The Honeymooners‘ debut, we visited some of the Brooklyn sites where Gleason grew up, went to school and learned how to make us laugh. Click through the slideshow, and away we go! Diehard fans of The Honeymooners know that Ralph and Alice Kramden lived at 328 Chauncey Street. "Gleason patterned the Kramden's apartment after the one he lived in with his mother as a boy," writes biographer Dina-Marie Kulzer. "The address is even the same, 328 Chauncey Street. 'The place was dull. The bulbs weren't very bright. The surroundings were very bare,' remembered Gleason about his childhood home." 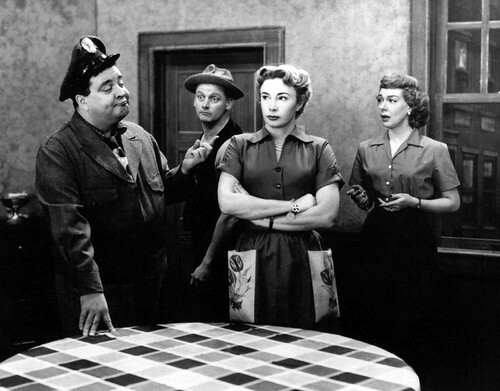 Frieda Broodno Storm grew up in the building and described Gleason's flat in The Honeymooners Lost Episodes. "The one big difference between the Kramden apartment and Jackie's was that in Jackie's, the bathroom was in the hall, and the tub was in the kitchen adjacent to the sink." Gleason was eight when he entered P.S. 73. "Jackie was late in going to school, but it didn't seem to matter, because he could already read, thanks to his mother, and he had an unusually retentive memory," notes Jackie Gleason: An Intimate Portrait of the Great One. "He soon became a nuisance to teachers, because he read ahead of the class and asked awkward questions and argued with the faculty." Gleason earned some of his first laughs on graduation night when he appeared in a school play. "When he knocked a microphone stool off the stage and the principal replaced it, he yelled, 'That's the first time you ever did anything for us kids!' The audience roared, but it didn't help to make him any more popular with the teachers." Gleason's father took his young son to the Halsey Theater on Saturday afternoons to watch silent comedies and vaudeville acts. "Once he stood up in the Halsey while a comedian was performing," notes How Sweet It Is. "Jackie turned his back to the stage and saw all the people laughing their heads off. His father made him sit down but not before the little kid told his father he could do what that guy up there on the stage was doing." At 15, Gleason won an amateur contest at the Halsey and later became its emcee, earning no more than four dollars a night. The theater closed around 1945 and was demolished. Saratoga Square housing for seniors now occupies the site. Gleason's father abandoned his family on December 15, 1925. "On Christmas Eve, Mom and I went to midnight mass at Our Lady of Lourdes Church," Gleason recalled in How Sweet It Is. "I prayed that Pop was still alive — and that he would come back to us. I was scared to death." The church where Gleason received communion was destroyed in a fire in 1975. New York Yimby reports that the church's convent, the last remaining structure, is slated for residential development. A few blocks from Gleason's apartment is P.S. 137, "which accommodated students up to the sixth year of primary school, and which had a schoolyard designed for Gleason and his friends," according to The Golden Ham. "They played stickball and basketball, and when it rained they forced the door to the school after hours and played downstairs in the gymnasium." "The last thing Mae Gleason wanted to do was pull Jackie out of high school," notes The Golden Ham. "Jackie, somewhat fed up with school, offered no objection when a relative told the principal of Bushwick High that the sixteen-year-old boy was the sole support of his mother. He spent another few weeks at a trade high school, but in all, Jackie had only about a month of high school education." Gleason was a member of the Nomads, a gang of teens who played baseball, shot craps and chased girls. "When the boys had money, they went to the Myrtle Burlesque Theater, which featured Izzy Pickle and the Cucumbers," notes The Golden Ham. Cinema Treasures explains that the Myrtle, opened in 1910, was renamed the Rivoli Theater in 1933. The theater closed in 1963. Today the El Calvario Pentecostal Church occupies the building. Like the Central, the Folly and the Halsey Theaters, the Majestic Theater in downtown Brooklyn provided Gleason with steady work in 1934 during the Great Depression. 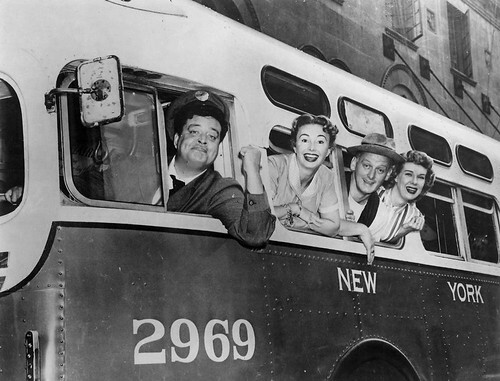 "He often worked two or three theatres at a time," the Jackie Gleason site notes, "skipping from Brooklyn to Jersey and back again in a single night." Opened in 1904, the Majestic showed a variety of musicals, dramas and vaudeville, then became a movie house in 1942. Closed in the 1960s, the Majestic was brought back to life as a playhouse in 1987 by the Brooklyn Academy of Music. "The Majestic sat abandoned for nearly two decades," BAM explains on its site. "Retaining original architectural elements, the theater's design maintained an aged look that creates a visceral bridge between the past and the future. In 1999, the Majestic was renamed in honor of retiring leader Harvey Lichtenstein." Before going solo, Gleason performed with his friend Charlie Cretter. "He put together an act he called 'The Sardonic Spectator' from old gag books and arranged a booking for him and Charlie at the Brooklyn Masonic Lodge," according to Jackie Gleason: An Intimate Portrait of the Great One. "Charlie came on stage to announce his partner hadn't shown up, and then Jackie, sitting in the crowd, yelled insults at him in Yiddish dialect. Then he rushed up to the stage, falling over three times in his haste like his favorite comedians in silent slapstick movies." "By 1909, the Brooklyn Masonic Temple operated as a meeting place for important events, such as political meetings and lectures," writes researcher Amanda Gruen. "The design of the temple gave consideration to such events for several reasons, though mainly because such occasions would provide income for the temple." Today the Temple's rooms continue to be available for rent for meetings and functions. The building that now houses the Brooklyn High School for Law and Technology "was once Brooklyn's largest and most magnificent vaudeville theatre with seating for 2,500 patrons," cites Brooklyn Relics. Opened in 1911, it later became a movie house and then a church. Comedian Phil Foster recalled in How Sweet It Is that Gleason made some of his earliest appearances at the Bushwick. "Jackie must have been around sixteen or so. I know he had quit school, as that was the legal age. We all entered amateur contests at the Bushwick Theater. He bombed like the rest of us but he kept trying."